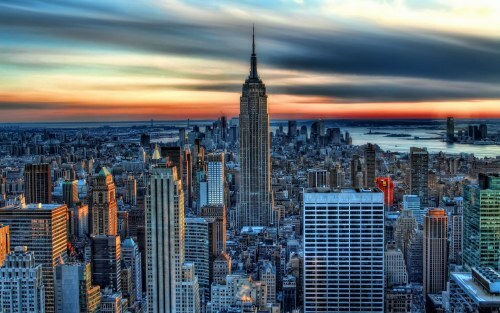 WestJet has dropped the price of their flights from Saskatoon to New York City down to $360 CAD roundtrip including taxes. The flights have 1 stop each way, in Calgary or Toronto. The flights that connect in Calgary fly into New York's JFK airport. The flights that connect in Toronto fly into New York's LGA (LaGuardia) airport. This is a new record for the cheapest roundtrip flights between Saskatoon and New York City. Update 3/7 - April, May, and June flights from Saskatoon to New York City are now available for $297 CAD roundtrip including taxes! Click on the departure date box to open up the calendar, and look for date combinations that are $305 CAD roundtrip. On Priceline, the price will show up as $217 USD roundtrip including taxes, which will work out to $297 CAD when booked using a Canadian credit card, and including the typical credit card foreign exchange fee. offers free flight cancellation within 24 hours of booking. 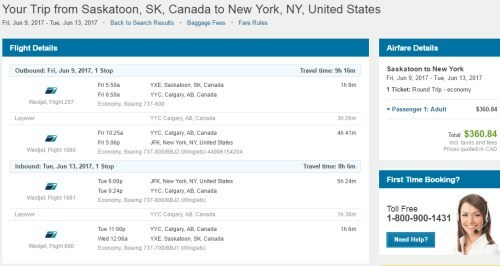 Update 3/21 - Flights from Saskatoon to New York City (LGA) in late April, May, and June can be booked today for $266 CAD roundtrip including taxes (they are 1-stop flights). The WestJet coupon code that makes this possible is available for today only. - Click on the departure date box to open the calendar view and look for the dates that are $314 CAD roundtrip in late April, May, and June 2017. With the coupon code, the price should now be $266 CAD roundtrip including taxes. saskatoon, yxe, flight deals, westjet, united states, new york city, new york, north america, lga, nyc and jfk.